One year after a shoreline breach in Lake Delton caused it to empty into the Wisconsin River, the water has returned. 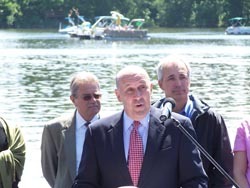 Governor Jim Doyle was in Wisconsin Dells on Tuesday to celebrate the restoration of the lake and the businesses it helps support. He says it&apos;s amazing that the community and state agencies were able to work together so quickly to repair the breach, expand the dam, and bring water back to the lake within a year. An expanded dam and modern engineering helped reconstruct the shoreline that washed out in June of last year, after days of heavy rains cause flooding across the region surrounding Lake Delton. Governor Doyle says it was a bigger job then just filling a hole back up with water. He says a great deal of effort went into getting the lake back in business. Doyle says the Wisconsin Dells area is a special place for many Wisconsin families, along with his own. During a ceremony at the site of the Tommy Bartlett Show on Tuesday, Doyle reflected on his own trips to the area as a young boy and on bringing his own children there as well. The Governor says the restoration effort is a symbol of the resiliency of the people of Wisconsin. The Governor on Tuesday also announced that 34 communities will share over $39 million in federal supplemental funds, provided by the Community Development Block Grant Program. 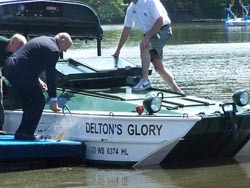 The funding can be used to help cover damages sustained during the 2008 floods.